What is the difference between a phonological disorder and an articulation disorder? As children mature they do not always gain the control to produce speech sounds in a clear concise manner. Actually, along the way of mastering speech production, children often tend to make several mistakes. Depending on their age at which they are still making these mistakes and/or the amount of their mistakes they are making helps determine if it is truly a disorder or not. Each individual speech sound has a different age range as to when the child should make a particular sound correctly. A common speech sound disorder is a phonological disorder which is a sound pattern problem. A phonological disorder or problem consists of patterns of sound errors involving altering the structure of words and/or substituting speech sounds. This pattern of sounds may be that the child makes all of the sounds that are supposed to be made in the back of the mouth, in the front of the mouth. For example, saying “tup” for “cup” or “do” for “go” involves substituting the /k/ and /g/ sounds in the back of the mouth for sounds in the front of the mouth, /t/ and /d/. This is known as “fronting”. “Cluster reduction” is another speech pattern problem which consists of taking a sound blend such as /gr/, /st/, /bl/, or /fl/ and omitting one of the sounds. Some examples of this are: “green” becomes “geen”, “street” becomes “teet”, “blue” becomes “boo” and “flag” becomes “fag”. Another pattern problem known as “final consonant deletion” involves speech sound errors which occur in a particular pattern, such as having a child leave off all or most of the end sounds of words such as “ba” for “ball” leaving off the /l/, “dah” for “dog” leaving off /g/, and “ki” for “kite” leaving off the /t/. An articulation disorder or problem is a speech sound problem involving not being able to make or produce individual sounds. An articulation disorder is the substituting(child says: /bish/ for /fish/), distorting (child says: /thpoon/ for /spoon/), omitting (child says: /cool/ for /school/) or adding (child says: /pban/ for /pan/) of sounds. This decreases a child’s speech clarity significantly, making it difficult to understand their speech. Children may have only a few sounds in error or several errors. Every child is different. Those children who have several errors are sometimes unable to be understood at all unless the subject matter which they are talking about is known to their listener. These errors that they do make will be consistently on the same sounds in a variety of words. For example, the /r/ sound may be substituted for /w/ and would then be produced as “wabbit”. The /r/ sound may be in error in the initial, medial, and final positions of words. For example, the word “race” becomes “wace”, “carrot” becomes “cawwot”, and “car” becomes “caw”. What do I do if I think my child has a phonological or an articulation problem? If you suspect that your child’s speech has a phonological or articulation disorder a speech-language pathologist (SLP) is a professional that analyzes and evaluates speech and language difficulties. You will want to contact your pediatrician (or your school district) and share your concerns with him or her. The pediatrician (or school district) will provide you with a referral to a speech-language pathologist to evaluate your child’s speech production and communication functioning. Your pediatrician (or school) and the SLP may recommend that you have a hearing evaluation to rule out a hearing loss which may be negatively impacting your child’s ability to perceive sound. The SLP will conduct an evaluation of your child’s speech sound productions, the oral mechanism, and often language development to determine their overall communication abilities. Depending on the severity of your child’s speech disorder, their ability to effectively communicate their needs, wants, thoughts and ideas may be compromised. School aged children with a speech disorder may have difficulty interacting with their peers and with communicating information to their teachers. Children with these disorders are at an increased risk for later reading, difficulty with spelling and learning disabilities, and they should be treated with speech therapy once they are diagnosed. 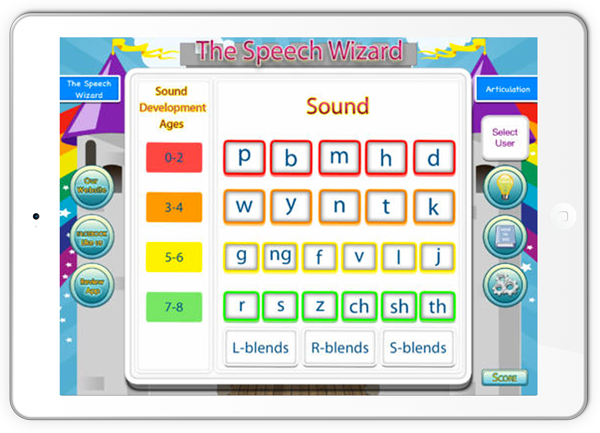 Articulation With The Speech Wizard is helping children around the world to improve their speech clarity. It provides 3 different levels of activities including: Sound Discrimination, Word Productions, and Phrase & Sentences Productions. It also was made using a child actress because we know that children respond better to a child’s voice as their model. We also included a Sound Development Age Chart to help select appropriate sounds (phonemes) to practice. 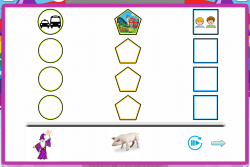 This app also includes two activities in Level 1, Sound Discrimination because we know and value the importance of phoneme awareness before attempting to go straight into speech production. Sounds With The Speech Wizard App is an app for improving listening skills that are essential for acquiring better speech productions and speech clarity. The app includes 3 different sound discrimination activities to keep users motivated and engaged. It is also a fun way to teach children how to answer Yes/No questions. Find Out Why Children All Over The World Are Listening Better! This important information all came from the American Speech-Language Hearing Association (ASHA) website. I wanted to post it to share it with even more people. Below is a link provided as a reference to get more information on other additional ages. 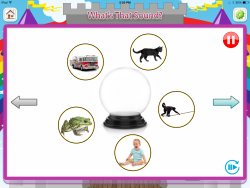 Our latest app, Sounds With The Speech Wizard is available through iTunes. It is only $6.99and has a Lite version to try it out before you buy it. This app has had over 2,000 downloads in its very first month and is getting widely used from the school setting, homes, and clinics. This app offers a variety of fun and engaging activities to improve listening skills through sound discrimination. It is also a great app for teaching children to answer yes/no questions. We are sure you’ll find it as beneficial as we do in our private practice. WHAT DO PICKY EATERS HAVE TO DO WITH SPEECH? As a licensed speech-language pathologist (SLP) there are several specialties you may acquire if you choose. Pediatric feeding therapy happens to be one of mine, along with assistive technology. And while many occupational therapists treat feeding problems, there are also many SLP’s who work with this. “Picky eating”, “feeding problem”, “feeding disorder”, whatever label you want to give it, is on the rise so I feel obligated to share some information on this topic. Approximately half (if not more) of my private practice has been and continues to be made up of pediatric feeding therapy. My specialty of pediatric feeding is a result of countless hours of additional studying from many amazing leaders in this area. My success in this field is from a combination of techniques learned and practiced from a variety of experts, but mostly from the SOS Approach to Feeding with Kay Toomey. It seems really odd to most as to why a child just does not eat. And then to make things even more unusual, why is it that they will eat one food on one day, and then won’t eat again? Or perhaps you have experienced the opposite of this. This would be when children who will eat but it needs to be the exact same food day and night everyday and they sometimes even get upset if it isn’t offered to them on daily basis. So there is no doubt that this is frustrating and can become a giant inconvenience. Most families in this situation are not able to attend some social gatherings due to food aversions and/or possibly cannot enjoy a meal out because their child will not eat anything on a restaurant menu. So before we jump into what do we do about it, I really need to share (or shut down) some common myths to feeding. Myth 1- Eating is instinctive. False- Eating is only instinctive for the 1st month of life, then reflexive until 6 months. Eating after this is completely learned behavior. Myth 2- If a child is hungry they will eat. They will not starve themselves. False- 4-6% of the pediatric population who have feeding problems, they will “starve” themselves (usually inadvertently however). For the majority of these children, feeding does not work and/or it hurts, and no amount of hunger is going to overcome that fact. Myth 3- If a child won’t eat, there is EITHER a behavioral OR an organic problem. False- Various research studies (Kay Toomey and Associates) indicates that between 65-95% of all children with feeding problems have a combination of behavioral AND organic problems. If you have a physical problem with eating, you are going to quickly learn that eating doesn’t work, it hurts, and you will develop a set of behaviors to avoid the task. If you start with a purely behavioral/environment reason for not eating, your compromised nutritional status will quickly begin to cause organic problems. They generally coexist. While pediatric feeding is one of my passions as a Speech-Language Pathologist, I do not and cannot do it all alone. It is crucial that it is approached and worked on as a team approach. I am fortunate to have an amazing team that includes an Occupational Therapist, Phd. Psychologist, and many medical doctors. Since this is an important area of my practice I will be posting more articles on the topic of pediatric feeding in the future. I encourage your feedback. Please feel free to write to me if you have further questions or would like more information regarding pediatric feeding at info@thespeechwizard.com. Fun Bites is a product that was on Shark Tank (my favorite TV show) that I wanted to share. As a pediatric feeding therapist, I feel this may help some parents with helping to get your child more interested in eating what you are serving. I use cookie cutters of all different shapes and sizes, however this can cut more at a time. This product will certainly be added to my collection at the clinic. Please feel free to write if you have any questions! We’d love to help!